An intensive period of transition is currently underway as the boomer generation – many of whom founded arts organizations at the onset of the movement – head to retirement. 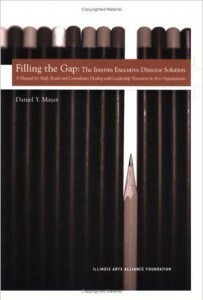 It is anticipated that in the course of the next five years, 70% of executive directors will leave their posts. Not all will retire; a good half will return into the system. But those organizations could be rudderless for a while, during a critical period that may dramatically impact the future well-being of their enterprises. Many arts organizations facing leadership transition cope by assigning a staff or board member to take the reigns as a search proceeds, or simply complete the search as quickly as possible. However, haste doesn’t always make for the best hiring decisions, and the strain placed on staff members who have been asked to double up on workplace responsibilities can have an equally negative effect on an organization. Taking a page from other fields who have learned the benefits of interim leadership, Daniel Mayer uses his own experience as an interim executive director (IED) to walk the reader through the issues and questions related to using IEDs to manage leadership transition. This guidebook will prove helpful to staff and board members of nonprofit organizations in need of an IED as well as consultants and other individuals who are considering becoming an IED. Includes an IED job description and „first day on the job“ to-do list, a discussion on the role of the artistic director in the transition process, and an organizational diagnostic list, as well as sample employment contracts and a detailed resource list for further reading.